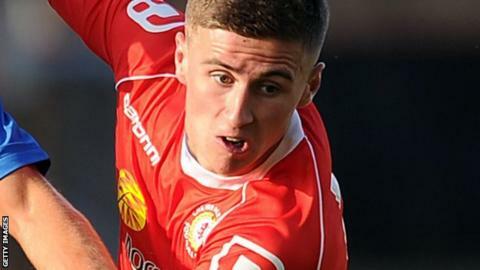 Ryan Colclough hit the winner as League One's bottom side Crewe claimed victory over Sheffield United. Jose Baxter forced a flying save from Ben Garratt with a long-range effort as the visitors started brightly. However, Colclough's off-balance scuff and Marcus Haber's glancing header both skewed narrowly wide as the hosts settled into the game. Colclough then scored Crewe's first goal in four games as he rifled past Mark Howard to seal the win. Match ends, Crewe Alexandra 1, Sheffield United 0. Second Half ends, Crewe Alexandra 1, Sheffield United 0. Foul by Jon Guthrie (Crewe Alexandra). Substitution, Crewe Alexandra. Lauri Dalla Valle replaces Ryan Colclough. Attempt missed. Ryan Flynn (Sheffield United) right footed shot from outside the box is too high. Corner, Sheffield United. Conceded by Ben Garratt. Corner, Sheffield United. Conceded by George Ray. Foul by Marcus Haber (Crewe Alexandra). Jose Baxter (Sheffield United) wins a free kick in the attacking half. Attempt missed. Conor Sammon (Sheffield United) header from the right side of the box is close, but misses to the right. Substitution, Crewe Alexandra. Chris Atkinson replaces Callum Saunders. Substitution, Crewe Alexandra. Stephen Kingsley replaces Bradden Inman. Substitution, Sheffield United. Stefan Scougall replaces Paul Coutts. Substitution, Sheffield United. Conor Sammon replaces Matt Done. Attempt missed. Che Adams (Sheffield United) right footed shot from outside the box is too high. Attempt missed. Callum Saunders (Crewe Alexandra) left footed shot from the left side of the box misses to the right. Ryan Colclough (Crewe Alexandra) wins a free kick in the defensive half. Foul by Paul Coutts (Sheffield United). Bradden Inman (Crewe Alexandra) wins a free kick in the attacking half. Dean Hammond (Sheffield United) wins a free kick in the defensive half. Goal! Crewe Alexandra 1, Sheffield United 0. Ryan Colclough (Crewe Alexandra) right footed shot from the centre of the box to the bottom left corner. Attempt missed. Adam King (Crewe Alexandra) right footed shot from more than 35 yards is too high. Attempt missed. James Jones (Crewe Alexandra) right footed shot from the right side of the box is too high. Attempt saved. Jose Baxter (Sheffield United) right footed shot from outside the box is saved in the bottom right corner. Attempt saved. Bradden Inman (Crewe Alexandra) right footed shot from the left side of the box is saved in the centre of the goal. Corner, Crewe Alexandra. Conceded by Chris Basham. Attempt saved. Dean Hammond (Sheffield United) right footed shot from outside the box is saved in the bottom left corner. Attempt saved. Ryan Colclough (Crewe Alexandra) right footed shot from the centre of the box is saved in the bottom left corner. Corner, Crewe Alexandra. Conceded by Robert Harris. Oliver Turton (Crewe Alexandra) wins a free kick on the right wing. Foul by Robert Harris (Sheffield United). Che Adams (Sheffield United) wins a free kick in the attacking half. Che Adams (Sheffield United) is shown the yellow card. Attempt blocked. Callum Saunders (Crewe Alexandra) left footed shot from the right side of the box is blocked. Foul by Callum Saunders (Crewe Alexandra). Dean Hammond (Sheffield United) wins a free kick in the attacking half.